The Mona Campbell Building acts as a gateway from the north into the Studley Campus of Dalhousie University. Located at the intersection of two main streets, Coburg Road and LeMarchant Street, the building interacts with the university campus and the surrounding residential communities. The building is programmatically diverse and houses four departments: the College of Continuing Education, the School of Social Work, the Faculty of Computer Science’s research space and the College of Sustainability all within 100,000 square feet. Such density of program was only possible by the precise integration of mechanical, structural, electrical and architectural systems, making single components serve multiple functions. This economy was achieved throughout the project by using an integrated design approach with a diverse client group, a skilled construction manager and a complete consultant team. A university is a place to promote the exchange of ideas. It is important to provide not only teaching and learning spaces but in-between spaces, where opportunities for the informal discussion of ideas occur between staff, students and visitors. These connective non-programmed spaces form the soul of the Mona Campbell Building. 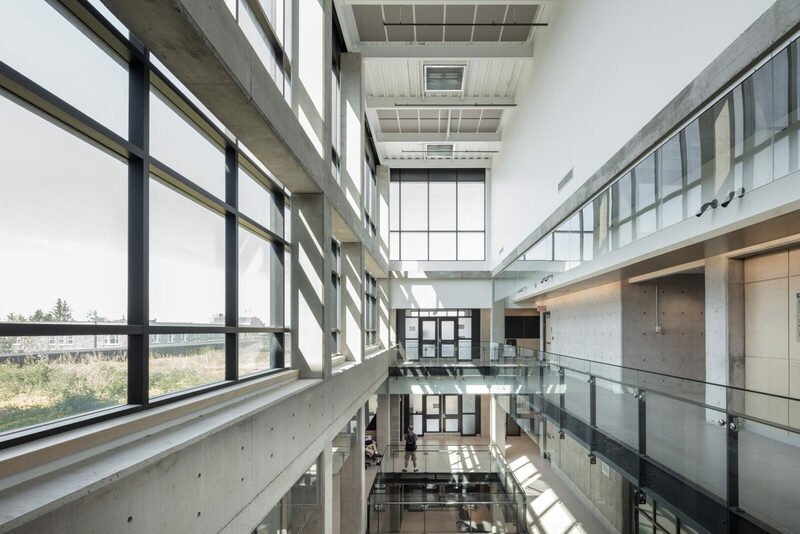 The four-storey south-facing central spine, or atrium, provides both physical and visual interaction with all departments while providing access to daylight and exterior green space. The form and section of the building address sustainability, program and context. The building is clearly ordered with zones for each function. Office spaces are located on the north side of the building while classroom spaces are located to the south, aligned with the interstitial south-facing atrium.